In “Dr. Seuss’ The Lorax,” the title character speaks for the trees. It’s another slow week for home video, with only one major theatrical release making its way to the big screen. Over the years, film lovers have seen a number of Dr. Seuss picture books get the feature-length film treatment, and the results have been mostly disappointing. Unfortunately, “The Lorax” continues that trend, but it does move in the right direction. “The Lorax” is considerably better than comedian Mike Myers’ disastrous 2003 update of “The Cat in the Hat” and director Ron Howard’s dull, 2000 adaptation of “How the Grinch Stole Christmas.” It’s also good enough that it should entertain its target audience: young children. When “The Lorax” struggles, it’s because it fails to maintain the momentum of Seuss’ source material, and the reason is obvious. Seuss’ “Lorax” book is less than 70 picture-filled pages, meaning screenwriters Ken Daurio and Cinco Paul were forced to drastically expand the scope of the story, and most of what they’ve added is filler. The movie is set in Thneedville, a town so environmentally bankrupt that the plants are made of metal and plastic and the town mogul maintains his fortune selling clean air. When a young man named Ted learns that the girl of his dreams longs to see a real tree, he decides to find one. The quest brings him face to face with the Once-ler, a strange, reclusive fellow who remembers when Thneedville was surrounded by grass and beautiful multicolored vegetation. As Ted learns about the past, he becomes more and more interested in building a better future. 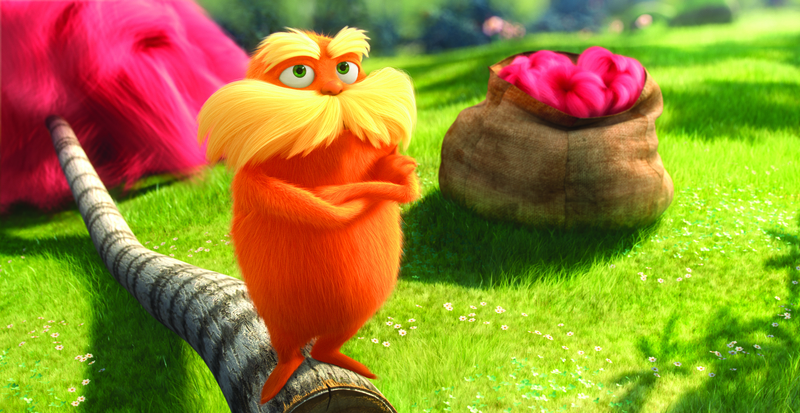 As with Seuss’ book, “The Lorax” packs a powerful message about the importance of protecting our natural environment, and directors Chris Renaud and Kyle Balda do a good job presenting that theme in a way kids will understand. They also immerse viewers into Seuss’ world using gorgeous digital animation and a number of well-crafted musical numbers. Another high point of this Seuss adaptation is the voice cast. Danny DeVito stars as the Lorax, the squat and furry title character who is devoted to preserving the natural environment. He is joined by Ed Helms as the Once-ler, Zac Efron as Ted, Taylor Swift as Ted’s would-be girlfriend and Betty White as Ted’s aunt. Where the film falters is in leaving the pages of Seuss’ book in an attempt to turn a 50-minute story into a 90-minute feature. This same problem was present in the 2008 screen adaptation of “Horton Hears a Who!” so it’s not surprising that the films share similarities. Both are watchable and both are capable of holding the interest of youngsters. They just don’t contain the consistently great storytelling of the best animated features. Home video extras include three mini movies related to “The Lorax,” a deleted scene, a lesson in drawing Seuss characters and an audio commentary with Renaud and Balda. “Grimm” – Season One: The second season of this supernatural drama is returning to NBC Aug. 13. That means newcomers and fans alike can get up to speed with the 22 episodes here. The show centers on the exploits of Nick Burkhardt (David Giuntoli), a homicide detective who learns that he is descended from a long line of crime fighters charged with keeping humanity safe from supernatural creatures. Russell Hornsby, Silas Weir Mitchell, Bitsie Tulloch, Reggie Lee and Sasha Roiz also star. “Strike Back” – Cinemax Season 1: First 10 episodes of the TV drama about two members of a secret intelligence agency (Philip Winchester and Sullivan Stapleton) attempting to track an international terrorist. Cinemax has already committed to a second season, which will begin airing Aug. 17. “Marley”: Documentary film examining the life and lasting influence of reggae legend Bob Marley. The feature includes rare performance footage and previously unreleased music. Directed by Kevin Macdonald (“State of Play,” “The Last King of Scotland”). “Bel Ami”: Drama about a former soldier (Robert Pattinson) who rises to power in early 20th century Paris by manipulating wealthy women. Christina Ricci, Uma Thurman, Kristin Scott Thomas and Colm Meaney also star. “Remains”: When a nuclear blast turns most of the world’s population into zombies, a group of surviving humans take shelter in a Reno, NV, casino. Grant Bowler, Lance Reddick, Miko Hughes and Tawny Cypress star. The film is based on an IDW Publishing graphic novel. “Blue Like Jazz”: Drama about a pious 19-year-old college student (Marshall Allman) who challenges his relationship with religion by attending a progressive liberal arts school. Based on the book by Donald Miller. Directed and co-written by Steve Taylor. “Let it Shine”: Disney Channel Original Movie based on the play “Cyrano de Bergerac.” The focus is on a young rapper named Cyrus (Tyler James Williams) who doesn’t have the self confidence to pursue the girl of his dreams, Roxie (Coco Jones). “Jesse Stone – Benefit of the Doubt”: Tom Selleck reprises the role of New England lawman Jesse Stone in this eighth TV movie based on characters by novelist Robert B. Parker. This time around, Stone finds himself investigating the killing of two police officers, including the man who took his job as police chief. “Parenthood” – Season Three: Another 18 episodes of the NBC dramedy about happenings in the lives of three generations of the Braverman family. Craig T. Nelson, Bonnie Bedelia, Peter Krause, Monica Potter, Dax Shepard and Lauren Graham star. “Clue”: Blu-ray debut of the 1985 comedy famous for making its way to theaters with three different endings. Thankfully, the Blu-ray has them all. Based on the Hasbro board game by the same name, the film focuses on six people who arrive at a strange house only to become suspects in a murder. Tim Curry, Christopher Lloyd, Madeline Kahn, Eileen Brennan, Martin Mull, Michael McKean and Lesley Ann Warren star. “Gunsmoke” – The Sixth Season, Volume 1: Nineteen episodes of the long-running TV series about U.S. Marshal Matt Dillon (James Arness) and his efforts to maintain order in the wild American West. Dennis Weaver, Amanda Blake and Milburn Stone also star. “Squidbillies” – Volume 5: Season five of the animated Cartoon Network show about a family of inbred squids living in the mountains of northern Georgia. I have been reading Dr. Seuss books to my kids lately, so when I put the Lorax in my Blockbuster at Home queue I knew exactly what to expect. The kids loved it and although they did add a lot of filler, I think they still did well to convey the environmental message. Some of they guys that I work with at Dish were talking about how Danny Devito was born for the role of the Lorax, and I would agree, but I think they were mainly talking about how they look like twins, lol. Either way it was a solid kid’s flick. They have also been playing the games on the disc non stop since we got it. Thank goodness that there are no late fee’s because I would be paying for it right now. Got about a third of the way through and stopped watching. Real bored. Not a kids movie that transcends to adults.